In this tutorial, I will show you how to write a very simple program. I am assuming that you have written ladder logic before, and that you have some basic familiarity with microcontrollers, but that you have never used LDmicro. If you don't know very much about ladder logic or PLCs, then the plcs.net tutorial might be helpful to you. Our device will have one pushbutton, and one LED. At startup, the LED will be off. When you press the pushbutton once, the LED will turn steady on. The second time you press the pushbutton, the LED will start blinking. The third time that you press the button, the LED will turn off again. On subsequent presses, the cycle will repeat. We will be using a PIC16F876, which is easily available from Digikey or other online distributors. It comes in a number of different packages; I chose a DIP. Note that as of Nov 2009, the PIC16F876 is no longer recommended for new design. This means that it will probably get discontinued at some point in the next few years. 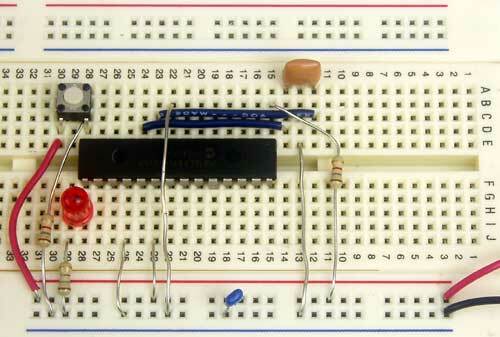 You may prefer to instead use a PIC16F886, which is pin-compatible. If you do, then make sure to specify the correct part when you compile, since the 'F886 is not code-compatible. 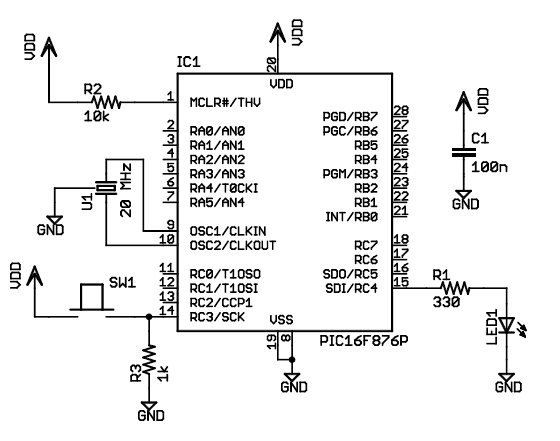 The microcontroller (IC1) is part number PIC16F876-20I/SP-ND at Digikey. Almost any three-terminal resonator (U1) will do; you might try a 535-9356-ND or an X909-ND. The only thing that might confuse you is that the pushbutton goes to Vdd, and there is a pull-down. You might be more used to seeing a pushbutton to ground with a pull-up. For TTL, this mattered. For modern CMOS it does not, and I find this `active HIGH' arrangement less confusing than the traditional `active LOW' circuit. Also, I chose to use a ceramic resonator with internal capacitors, U1, instead of a crystal and two ~20 pF caps. A crystal would work just as well and it would be more accurate, but it would be a little bit more expensive, and you would need more parts. This will flash at 1/((250+250) ms), or 2 Hz, or twice per second. The duty cycle will be 50%—250 ms on, then 250 ms off. This circuit can make any kind of oscillator, with whatever period or duty cycle you require, so it is a good one to remember. Also notice that we have chosen to use an internal relay (`Rfoo') instead of one attached to an I/O pin (`Yfoo' or `Xfoo'). This makes sense, because there is no particular reason to bring that signal out to a pin. LDmicro will automatically assign memory for the internal relay. It should be easy to convince yourself that this does what we want. If the program is in state 1, then the `Cstate == 1' instruction energizes `Yled', as desired. In state 2, the `Cstate == 2' instruction energizes `Yled', but only when `Rosc' is also true. Since `Rosc' is oscillating, that means that the LED will blink, as desired. Finally, in state 0, neither of the equals instructions will be true, so there is no way that `Yled' could ever turn on. Now we can insert the rest of that rung in the same way. Click on the left edge of the coil, so that the cursor is vertical, and to the left of the coil. Now choose Instruction -> Insert TON (Delayed Turn On). Once again double-click the timer to rename it and set the period. Add the TOF timer and the contacts in the same way. Now we are ready to simulate our circuit. Choose Simulate -> Simulation Mode. The display will change; the ladder diagram will appear mostly greyed, but you won't see anything changing with time. That is because the PLC is not yet cycling. To start it cycling, choose Simulate -> Start Real-Time Simulation. Now you will see things happening: the oscillator is obviously running, but the LED (`Yled') is still off, which is what we want, because no one has pressed the button yet. To simulate pressing the button, double-click the text `Xbutton' in the list at the bottom of the screen. You have now simulated bringing the pushbutton input high; this is what would happen if someone depressed (but did not yet release) the pushbutton. You can see that the program is working: the `Cstate' counter is now equal to 1, which corresponds to the `steady on' state, which is what we want. The LED output is high; you can see that its value is 1 in the list, and the `Yled' coil appears red on the diagram. Double-click the `Xbutton' text in the list to simulate releasing the button, then double-click it again to simulate pressing it again; the `Yled' coil will start blinking, as designed. If you simulate a third button press then the output will go steady low. So now we are fairly sure that the program works. At this point we are ready to generate actual code, and try it in the micro. 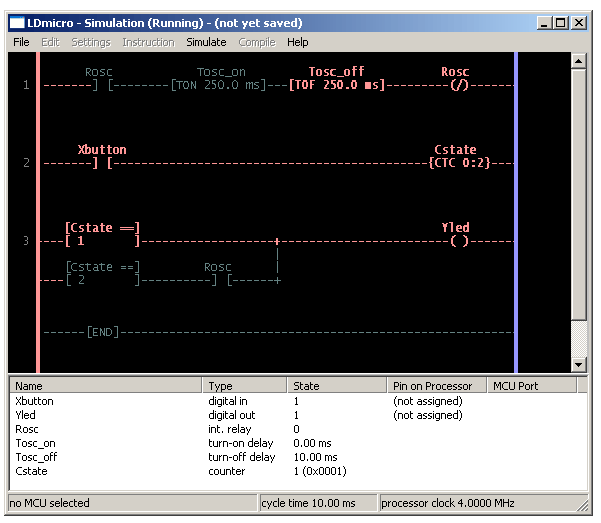 First, exit simulation mode by choosing Simulate -> Simulation Mode, or by pressing Escape. Next we must choose a microcontroller. We decided earlier that we would be using a PIC16F876, so choose Settings -> Microcontroller -> Microchip PIC16F876 28-PDIP or 28-SOIC. We also have to tell LDmicro what kind of crystal we will be using, and what the cycle time will be. Choose Settings -> MCU Parameters, and fill in our clock speed of 20 MHz. Leave the cycle time at 10 ms; that will usually be a good value. 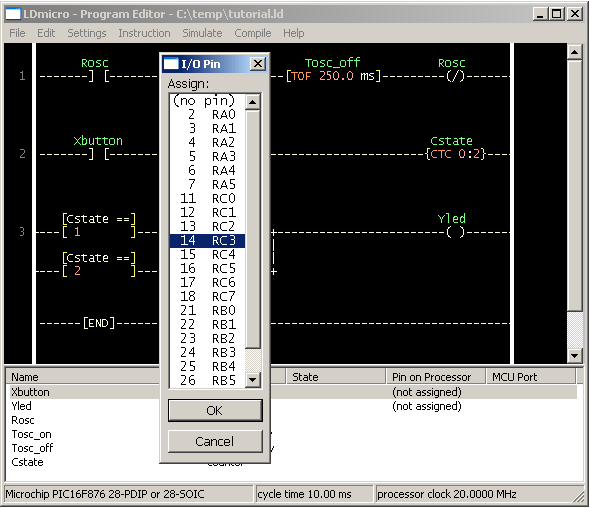 Click `OK,' and then repeat the process for `Yled', which you can see from the schematic should go to pin 15. The other elements in the list are internal variables and bits in memory, so there is no need to assign pins to them. LDmicro will allocate memory for them when you compile. So now you are ready to compile. Choose Compile -> Compile, and specify where you want to put the IHEX file. Then use whatever PIC programming equipment you have available to load that into your device, and you are ready to try it out. This completes my tutorial. It is possible to write much more complex programs than that, of course. A program this simple uses only a very small fraction of your processor's memory, so there is room for many more rungs of logic. LDmicro also offers specialised instructions, for things like arithmetic, analog (A/D) inputs, PWM, and even text output to a character-based LCD. Consult the manual for details. I don't see why you would need to, but you can download the tutorial program premade.